Canada is currently having a national debate about the niqab, the face veil worn by a small number of Muslim women, after a woman did not remove hers during a citizenship ceremony. She then asked a federal court to make a ruling about the legality of the Conservative government’s policy that stipulates women must remove the niqab during the oath-swearing portion of a citizenship ceremony. A passionate debate on the matter has emerged, with some people saying the niqab is rooted in a sexist culture and that it is a practice oppressive to women. While teaching a course on Women’s & Gender Studies at the University of Regina, a student from Syria told me that her decision to wear the hijab, a veil that covers the head and chest, was not forced on her by sexism; rather, it was a personal, spiritual decision. Stories are important for bringing a new understanding and awareness. They can help dispel myths, break stereotypes and correct false assumptions. Stories are also a way for people to express their truths. Rather than talk about Muslim women who wear the niqab, it would be useful to make space for niqab-wearing women to be able to share their stories and for everyone else to listen. 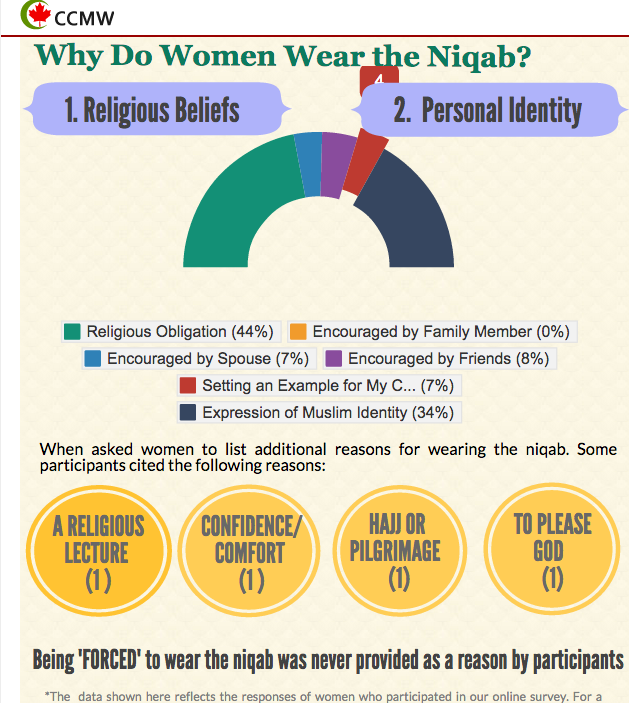 In this study, Women in Niqab Speak: A Study of the Niqab in Canada, 81 women were interviewed, and “being forced” to wear the niqab was never provided as a reason for wearing it. In this powerful interview that aired on The Current, three women who wear, or have worn, the niqab share their reasons for choosing to wear it, as well as the impact that choice has had on their lives and their loved ones. Another woman, Ingri, immigrated to Weyburn from Chile, and told us a story about going shopping with a friend from El Salvador. The Salvadorian woman would wear her apron instead of a purse, said Ingri, who appreciated that her friend could continue practicing her cultural customs in Saskatchewan, instead of being forced to assimilate into Canadian culture. One of our PSAs, “From Many Peoples Strength,” reflects the idea that everyone has a story to tell. Sharing our stories and respecting one another’s culture helps build a stronger community. Hope very soon we will stop it. Because it is not normal women have to wear something. Look, here is a new writing service 99 papers I think this service is one of the best, I even ordered there essay. That's to good advise i really like your post. Gifts to Pakistan .